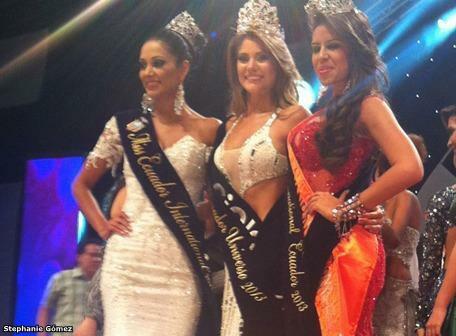 Constanza Báez, 22, was crowned Miss Ecuador 2013 during a televised gala at the Teatro Centro Cívico Eloy Alfaro in Guayaquil on March 8th. She will compete in Miss Universe 2013. The first runner-up and winner of the title Miss Ecuador International was Nathaly Arroba who will compete in Miss International 2013. The second runner-up and winner of the title Miss Ecuador Supranational was Giuliana Villavicencio who will compete in Miss Supranational 2013.